Vyacheslav Dulyov - solo bayan-player, ensemble-player, accompanist, arranger, composer, teacher, manager. He was innovative in many kinds of accordion activity in Karelia (North-West Russia). V. Dulyov was born on April 15th, 1935, in the village of Porosozero in the Suoyarvi area of Karelia. Since he was 13 years old, he has played the bayan (Russian accordion) by ear. In 1950 he enrolled in the Petrozavodsk Music College (under his teacher R. K. Niemi). He completed music college in 1954 with highest awards. In 1962 he graduated from the Byelorussian Conservatory in Minsk (under E. M. Lembovich). In 1962 V. Dulyov performed a solo concert at the Petrozavodsk Music College - it was the first given by a Karelian bayan player. For many years he performed as a soloist, as well as in a bayan duet with Evgeny Ishanin, in a bayan trio "Karelia", as an accompanist in a folk chorus and the folk ensemble "Zoryane". In addition, he created the instrumental trio (E. Belorukova - a balalaika, S. Frolov - a contrabass). Many times he performed with concert brigades left in Finland, Germany, Sweden. 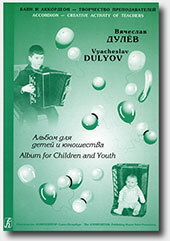 From 1965 to 1975 V. Dulyov was the chief of the folk instrument department of the music college. From 1975 to 1982 he was the college director. V. Dulyov is the composer of numerous songs and dances, pieces for bayan and original music for 30 performances at the Petrozavodsk Puppet Theatre. He has written arrangements for duet, trio, quartet and orchestra of bayan players. V. Dulyov was presented the state award "The Veteran of Work" (1984). He was also awarded Certificates of Honour from the Ministry of the Culture of the USSR and Karelian Committee of TV and Broadcasting. He was recognized in the Book of Honour from the Ministry of Culture of Karelia (1985). In 1988 V. Dulyov was recognized as the Honoured Artist of Karelia.